I love magic. In every form. There’s something about it which gives me joy, wonderment and hope. As a child, I found nothing more entertaining than watching rabbits crawling out of empty hats, things appearing from nowhere, money falling out of people’s ears, noses and whatsoever. As I grew up, I found tales of flying carpets, magic faraway trees, obliging genies and angelic fairy godmothers more pleasing than man landing on the moon and mountains. They transported me away from my world of exams, homework, evil Math teachers, more evil Math problems and many such woeful entities. With time, films and books did their bit, adding more fuel to the fire – and I was possessed. From Gupi Gyne to Gargantua, I grew wide eyed about everything which did things out of the ordinary. Like this neat bunch of raw bananas for example, which the next-door aunty lovingly gave me just a few days back. Now bananas I like but for the life of me couldn’t imagine how people possibly liked to eat them raw! Now no offense to those who like it, it's just that I have too many tragic childhood memories to let go off. As a kid I hated them, but somehow they always found a place in my mother’s kitchen under some pretext. Worse if someone had a tummy upset, this unpalatable vegetable would feature in almost everything that was on the menu for that day. I myself nursed horrific memories of it literally being shoved down my throat whenever I complained of a tummy upset. To cut a long story short, I never found them delectable enough to feature on my Most Wanted food list. Now these bananas were plucked from her tree (“You can make yummy thoran with these, you know?”) and were lying in my refrigerator for long. They would have eventually found their way to the dustbin, had they not known magic. They turned into these beautiful koftas (dumplings) yesterday morning which did not look, feel or taste like anything that reminded me of my tragic childhood. Sometimes we all could do with a bit of magic in our lives, don’t you think? Peel the bananas, cut them into three and boil them in salted water till they soften. Once cooled, mash them nicely with a fork. Add salt, chopped green chillies, grated ginger, chopped coriander, a squirt of lemon juice or amchoor. Mix well. Make them into neat balls and fry them in hot oil. Keep aside. Next fry the quartered potatoes with salt and a pinch of turmeric and keep aside. Heat oil in a pan, add a pinch of asafetida (hing) whole cumin seeds and let them crackle. Next add all the powdered masalas (except garam masala), little water and mix well. Add the chopped tomatoes next. Stir well till they become mushy and soft. Add the fried potatoes. Stir well till they are nicely coated with all the masala. Add a cup of hot water into this once the oil starts separating from the masala. Bring it to a boil. 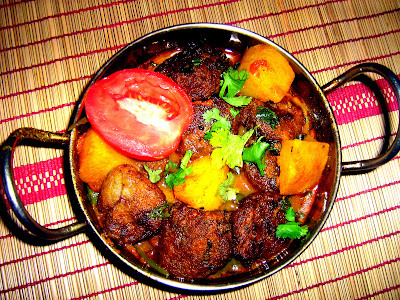 Gently release the fried koftas (dumplings) into the gravy. Sprinkle some powdered garam masala and a dollop of ghee or butter on top. Let it simmer for 5 minutes. Add some chopped coriander for garnish. Serve hot with rice or chapatis. Welcome to my blog. I write about whatever's cooking in my kitchen. Or on my mind. For queries, suggestions and feedback, do get in touch with me at letspakao@gmail.com.